You have a new electronics product, ready to put on the market and think it is the next hottest electronic widget that will be all the rage. So you do your initial product testing and see nothing wrong with your design. But wait.... have you ever heard of a HALT test? 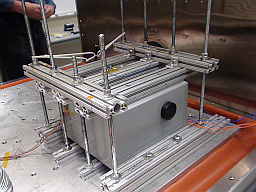 A HALT (Highly Accelerated Life Test) is a tool for identifying design limitations in a product (intentional or not) by applying temperature and vibration stimulus to the product until it fails. Ok, you take it upon yourself or a friend to do some testing, to make it more official. So, with a product's specifications in hand and a HALT chamber at one's disposal, its a simple matter of clamping the product securely to the table, starting the vibration and temperature stresses, and waiting until something breaks, right?. Perhaps. But wait! What if it turns out that the product stopped working because a screw backed out and became wedged in a gear or belt mechanism? Sure, backed-out fasteners are events worthy of being noted, but it is not the sort of failure mode that tells you much about your product. Often the challenge during HALT execution is that many failures may occur during the test, some of which may be considered incidental to the real objective of the test. Some may also be failures of the support equipment which don't relate to the real failures you are trying to identify. Since HALT chamber time is quite expensive, care must be taken during the test design to ensure that valuable machine time is not wasted diagnosing irrelevant failures or stopping to repair a support instrument. Understanding the difference between a relevant failure and irrelevant failures is key to successful HALT. Because of our experience, Percept can design the test to minimize unnecessary stoppages. By properly staging the product—and the support equipment—before HALT, we develop a plan that stresses the product to a useful breaking point without stopping, thereby, saving the loss of valuable chamber time. In our example scenario above, it might have been prudent to apply a thread-locking compound on the fasteners prior to the HALT test. But who would have known that such an event might have happened? A test engineer with Percept’s experience would have. The engineers at Percept familiarize themselves with the operation of the product to be tested and anticipate such test disruptions. That is why careful planning is paramount to a successful HALT test.